Tour de Fleece 2013 – mojo and mojitos. The Tour de Fleece runs every year, for the duration of the Tour de France, hand-spinners all over the world set their own wheels spinning, like the cyclists, setting themselves challenges and try to spin yarn daily, even if it’s just for ten minutes. Some people use the Tour to expand their skills, others just to have fun. On Ravelry, many join teams and spin along with friends. 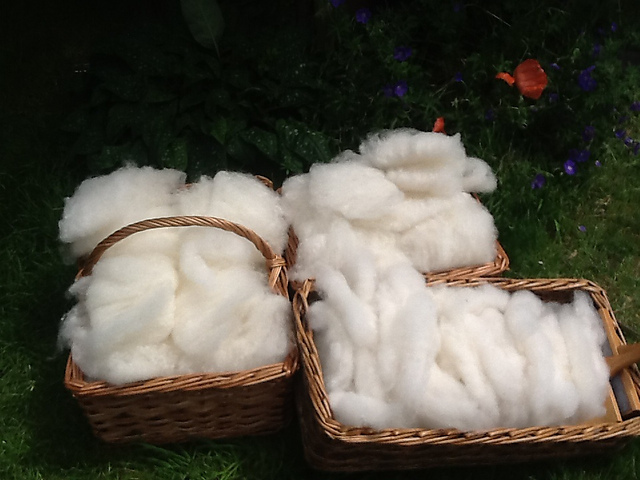 I was going great guns in the first week – not only spinning entire bobbins per day but scouring pounds of raw fleece too. But sadly, there’s been an unintentional break in my Tour de Fleece. Mainly due to having to be prosecution witness in a court case two hundred miles away, which predictably, got scheduled slap bang in the middle of the second week of the Tour. We were exhausted when we got back from London, and then we were rushing around like blue-arsed flies with a practice 1800 Living History event. I’ve been wiped out since the weekend – although during the event I did manage to spin one cop of wool on my Great Wheel. Am hoping my Tour will get going again, today, as I am working on an 18thC knitting pattern for a magazine, and have decided to handspin the wool needed, to make a second sample for the photoshoot – so the pattern will be written for a commercial yarn, but I am going to make a more precise repro of the item, from handspun. (As the grist of the yarn in question turned out to be somewhere between DK and Aran; not precisely either, so handspun will give me a more accurate repro!) Like almost all ‘old’ knitting, the item I am reverse engineering is from a 2 ply yarn. I realised I had some tops, already dyed with madder, which will be perfect. I used to spin whatever I felt like spinning, but the older I get, the more I seem to spin to purpose. It’s quite an interesting challenge to spin yarn to reproduce 18thC wool with a fairly hefty grist. In an attempt to regain my previous Tour mojo, here is some of my spinning so far – which was going great til I had the ‘break’! One basket was hand-carded (the ‘picklock’ or ultra top quality wool). The other two, still really prime wool, were drum carded batts, carded on my trusty old David Barnett drum-carder. One of these baskets has since been re-carded by hand, as I realised I had spun the rest and needed the final basket for Living History, where small rolags are more authentic. After a few days, I got bored spinning 3-4oz of creamy white Cheviot every day, so ended up spinning some art yarn and silk and other odds and ends, to stop me from going crazy. This means, so far during the Tour, I have spun woollen and worsted; wool, silk and even some trilobal nylon I had a tiny sample of in deep stash. I always think that anyone can spin worsted. After all, that’s how you start – inch-worming with a short, forward draw, as a rule. Some spinners spend their first few years spinning nothing but worsted or semi-worsted from commercial or hand-combed tops, if you think about it. Following recent debate on Ravelry re. what makes a “good” spinner – one criteria for me, anyway, is to be someone who can spin decent woollen yarn. Handspun – especially worsted – can look very solid. Badly spun handspun looks lifeless and dead. Of course, if you block the bejaybus out of it, it will never knit up into a decent fabric, either. I know there are spinning gurus and their acolytes who believe that spinning worsted is The One True Spinning. But for me, the true challenge for a spinner, is to spin woollen that is light, airy and well balanced. Because that is far harder to do: to consciously spin light, airy, yarns. The secret is not only in the spinning but in the fibre preparation – your aim is to trap a tube of air down the centre of a rolag as fluffy as a squirrel’s tail! I have seen some shots of lifeless, lank, over-processed handspun online, recently – you can somehow tell when a yarn is ‘dead’ as a Norwegian Blue parrot, even just from a photo. Now woollen yarn spun longdraw in a relaxed way is, for me, the epitome of what handspinning is about; the ability to spin airy yarn that has some life to it and does not look lumpen or dead. It’s not about “perfection” – almost the opposite. I had a little Tour de Fleece side challenge which I have only been practising for, so far: to spin 1g of some fine wool to 100 yards. As it seemed like an idiotic challenge to me, and when I read that apparently this ridiculous, in the realms of World’s Longest Thread spinning, is everyday stuff for a “good” spinner, I had to accept the challenge. I’ve been spinning thirty odd years and never needed or wanted yarn like spiders’ eyelashes once. But for me some of this Tour is about what constitutes “good” spinning – I thought I’d explore definitions even at their most idiotic extreme. I may have lost over a week of my Tour, but I intend to use the time to explore this whole concept of “good” spinning, subjectively and objectively. I will probably not get round to the Spider Eyelashes, but if I do, will post my results here. My only Tour spindle spinning so far has been on this fantastic little spindle. As a Living Historian, I have spent my life spinning on wood, lead, bone, horn or original medieval spindle whorls. So Almost Alien’s vividly coloured little doodad was a novelty I couldn’t resist at Woolfest. Almost Aliens are modular – they are made from 3D printed whorls in different weights, which you can change as you go. Hooks are removable and replaceable and – the cleverest thing of all – the spindle shaft has a carbon fibre bobbin, so when full, a bit like a paper quill on a Great Wheel, you can just slip it off then block on the bobbin, or ply from two bobbins rather than plying from the spindle. I got the ultra light and love it so much, I am considering getting a kit. I bought mine near the end of the Saturday at Woolfest and didn’t want a kit, just one spindle and one whorl – so Brandon kindly sold me his demo spindle. The Almost Alien is a good spinner; spins for a long time and I love the fact I’m not likely to break the whorl if I sit on it. Which happens. Also if I break or lose the hook, can simply get another. I was spinning silk tops – again, just a tiny sample bag I’ve had in the drawer for maybe a decade! The term “Art Yarn” can be a polite way to say “crap spinning” – ie: unintentionally thick n thin, with nepps in. In my case, “Art Yarn” tends to be the spinning that happens when the sun is over the yard-arm… But really, I think something only qualifies as real “Art Yarn” if it has some ridiculous plying method going on, or you have spun earwigs into it, or something… Here is some “Art Yarn” I spun one or two mojitos in to the evening, one night as an antidote to all the bobbins of white Cheviot. In the centre: merino (?) plied with a small sample of trilobal nylon bought so long ago I’m not sure where it came from. Outer nest = BFL from the excellent Babylonglegs. My other Tour chore was scouring the accumulated raw fleeces. My favourite so far has been the incredible Organic Lleyn fleece, bought for a tenner at Woolfest. It has been one of the best fleeces I have ever bought – and over the years that’s a lot of fleeces! Am still wiped out, but will try and pick up where I left off, and regain some TdF mojo, today! One last basket of Cheviot to go and, despite having over a week off, I will have completed my main aim for this year’s Tour. Also have a small, gorgeous moorit Shetland fleece to scour whilst we have this good weather, and a Ryeland from Karen at Wildcraft. Then to decide what to do with the coffee coloured Ryeland; the grey, white and moorit Shetlands and the lovely, top quality Lleyn fleeces scoured during the Tour. I am hoping to be able to run courses on hand-spinning, as well as inland ganseys and 19thC Dales knitting, in the very near future. If any of yous have some preferences, as to what you’d love to learn, drop me a line (penelopehemingwayATgmail.com). ← Close Knit, or Nalbinded? This is a brilliant post, sweetie. I keep meaning to do the Tour de Fleece every year, but I’m always doing things (this year, two day teaching dye workshop and then Fibre East) so it never happens. I have a lovely fleece I’ve washed that I want to spin woollen.